Join the discussion on our forums! Come discuss Magic Dart Frog over in our dedicated Magic Dart Frog discussion topic. There's a powerful throat in this frog. When i see this card i think this would be a great replacement in steat of manawyrm. The problem with manawyrm was that the effect was permanent. The effect of this card is random between face and board with gives randomnes like the missisels. Make it a 1 cost and tempo mage will be resurrected. This is just a bad +1 spell damage. The reason Flamewaker was good is the 2 damage that could go face. The frog on an enemy empty board is just useless. 53% saying playable or worse. It's beyond words how bad this community is at rating cards. True, it's not a flamewaker. Flamewalker was just great - great stats, great effect. But those are the old days, we can't have it all :) flamewaker was pretty darn strong. Minion, guys. So unlike Flamewaker it won't waste all its shots on face when you just need it to kill a 1-health minion. What do you mean with "waste"?? Face is the place! 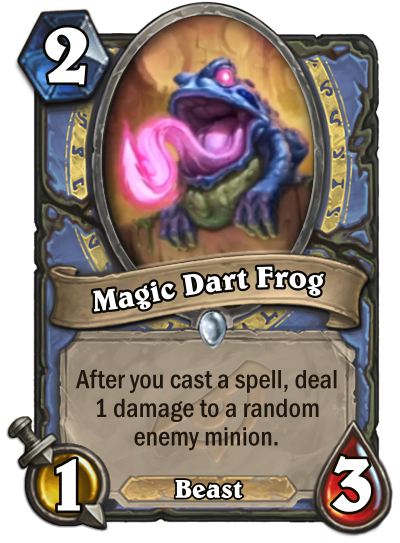 Jokes aside i think if some sort of Tempo Mage with cheap spells is good this will be in the deck. Its a balanced card. I really like the design tho.